A couple of months ago, myself and Aimee (at Aimee Raindrop Writes) set ourselves a challenge: as blogging besties with a love for books, we decided to each read the other person's three favourite books of all time. 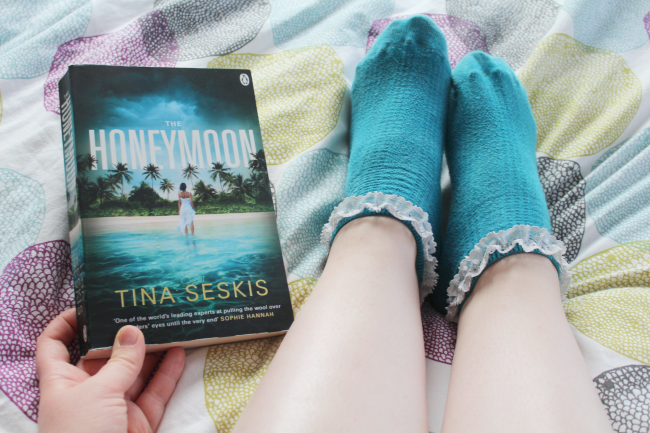 You'll have to check out Aimee's blog for the future post on the first of my top three she's read, but for now, here's The Honeymoon by Tina Seksis. We've broken this down into parts, each of us rating an aspect of the novel out of five and giving our opinions on it. I'm a big fan of YA, cheesy chick-flick and the odd classic, whilst Aimee's more in to thrillers/horror, crime fiction and a whole lot of classics too, especially short stories. As you can imagine, our takes from these books are going to be quite different. Steph: I SO wanted to completely dig this plot, but I guessed the big twist a page or two before it happened, so it made me feel a little let down. I loved the idea behind a honeymoon gone wrong, and whilst I imagine there are a fair few books out there about it, I haven’t come across one that’s anything like this. The use of memory loss for the big night in question was perfect, and I’m sure we’ve all been there on nights where we have one (or a few) too many, and the next morning is full of confusion. One of my favourite parts was the twist towards the start, that I’m not going to spoiler for you, but I definitely didn’t see how Jemma’s relationship would have seen her heading to the Maldives for a spectacular honeymoon. Aimee: I love a good page-turner that’ll keep me guessing till the final page. And the Honeymoon had all the elements needed to make this a five star mystery. I’m super jealous that Steph guessed at the plot twist before the ending. I honestly had no clue! You’d have to be pretty dumb to honestly have no clue what the big reveal might be - but I truly had not put two and two together. And that’s one of the main reasons why I loved this book so much - for its unpredictability. There aren’t many books that can keep me guessing till the very end. There’s so much more I loved about this book, though. Its characters, and character development. Its originality; this is a book like no other I’ve ever read. And that’s why it’s one of my favourite reads this year. Steph: I really struggled to like some of the characters, and although I understand that with thrillers a lot of the time we’re not meant to like the characters, I always want to. I found Jemma someone that was hard to relate to. Her relationship with her husband is fraught with tension and underlying dislike. I love reading about strong female characters, and she just didn’t do it for me: she was pushed around by a whole host of men and she never really held her own in any way against anyone. However, all was definitely not lost. Seksis makes some truly complex characters, and develops them in such a natural way in a short amount of time that it makes up for the fact that you might not like any of them all that much. Jemma’s husband is loving, and then malicious, and then cold, her ex is sweet with a bit of a mean streak, and he can hold a grudge, and Jemma’s dad is a proud man who wants to support his daughter but doesn’t quite know the best way to do this. There are some stellar characters in there. Aimee: You’ll have to forgive me, it’s been a while since I read this book last. A year or more ago, in fact. So my memories of this novel are a little sketchy. However it stands out to me as being one of my favourite reads ever. Which is why I can still write a review about it. Tina created some superb characters in her novel. I loved seeing Jemma’s character develop as the story unfolded; and seeing how she dealt with the mystery of her missing husband. However, I can’t help thinking Tina missed a trick in not crafting Jemma as a stronger female. Even though many of the characters were hard to like, the natural unfolding of their characters over the relatively short space of time the story unfolds in more than made up for it. And, at the end of the day, don’t we all love a story with a hero and a villian? Steph: The book was easy to get through, which is exactly what you need for a good thriller. I found myself glued to it to see what happened next. There were a couple of points where the narrative dragged a little, but it worked well; it was during the parts where Jemma felt as though her days were stretching out without end and she didn’t know what to do. In that way, it made me feel a little closer to our protagonist. Aimee: I never felt as though the narrative dragged. The story unfolded at such a quick pace that I was compelled to keep reading, even when I really should have put the book down to get on with real life! Like Steph said, this was a very easy read, which is part of what made it a great thriller. It was narrated excellently to help fully immerse you in the world of Jemma and her missing husband. Steph: It has to be when you find out exactly who Jemma is on her honeymoon with. I was all DAAAAAMN GIRL YOU DID THAT when I realised that something was off with the whole set up and found out who she’s loved up with. It was one of the biggest shocks of the book and I love a bit of drama. Aimee: There’s so many to choose from. Steph’s chosen a brilliant moment in the novel that really does have you thinking, “DAYUM.” But my favourite part would have to be that ending. Gruesome? Check. Totally unexpected? Check. A stand-out moment? Check! Is it a good thriller? Steph: Definitely. You have everything you need: suspicious characters, an isolated setting, untrustworthy family members, shady secrets and a whole lot of stormy weather. In all seriousness, it was a good’un. The twist was kept right up until almost the very last moment, and it had you whizzing through the pages to see what really happened. Aimee: One hundred per cent. This is a thriller that really delivers a totally compelling read. With the perfect twist kept hidden right up until the very end, this book will definitely keep you guessing. Steph: I loved the idea of having this nightmare of a situation set in paradise. The honeymooners are in a beautiful beach hut on a small Maldivian island. So many thrillers rely on dark alleyways or grotty hotels, and it was great to see this trope turned on its head. Aimee: It wasn’t a very relatable setting. Don’t get me wrong, I loved the idea of the picture perfect island; beach huts, golden sands, blue skies. But it’s not a part of the world I’ve ever experienced. So I guess I found it a little tricky to really visualise it. But that in no way marred my overall reading experience. Steph: I would give this a 4 out of 5. Although it was definitely an enjoyable read, I wouldn’t rate it up with the likes of Gone Girl or Before I Go To Sleep. I would definitely recommend it if you’re into thrillers and want something a little different to the bog standard ones out there. Aimee: I think this is one of the best thrillers I’ve ever read. And I’ve read more than a few. Unlike Steph, I definitely think this rates up there with Gone Girl or Before I Go To Sleep. I’ve recommended this book to so many people in the year, plus, since I’ve read it. And I’ll never stop raving about it! Without a doubt, I give this a 5 out of 5. I hope you liked this style of review, and I can't wait to share the rest with you in the future! This is such a great idea for a blogger collaboration. :-) I really like how you both reviewed the book. Thank you! It was such a fun thing to do!